In May 1965, a number of musicians in Chicago decided to create the Association for the Advancement of Creative Musicians, AACM in short, a non-profit organization of African American musicians who wanted have the freedom to bring their own music, free of commercial pressure, free to develop their own ideas. The amazing thing is that today, fifty years later, many of these founding and early members – Muhal Richard Abrams, Steve McCall, Henry Threadgill, Lester Bowie, Joseph Jarman, Roscoe Mitchell, Anthony Braxton, Leroy Jenkins, George Lewis, Amina Claudine Meyers - became absolute figureheads of the new jazz movement, and their names still resonate today, probably in a way the founders (and their critics!) could never have imagined. When you look at it from a local and historic perspective, these musicians wanted to have their voice heard, giving local African American artists the opportunity to develop their own voice, and to mutually support each other in this endeavor. As George Lewis writes in his book “A Power Stronger Than Itself: The AACM and American Experimental Music”, after the ‘silencing’ of slavery, “African Americans developed an array of musical practices that encouraged all to speak (as distinct from an aestheticized silence of four minutes or so)” (a reference to John Cage’s ‘composition’). Their effort was closely linked to the then heavy social struggle of Malcolm X, the Black Power movement and other organizations, the context of the Vietnam War, combined with the liberating and emancipating culture of the sixties. But even then, the initiative was still focused on those artists living on Chicago’s south-side, the friends who went to school and church together and who played in each other’s bands or in the Experimental Band, a loose rehearsal group created by Muhal Richard Abrams to practice group improvisation, the seed out of which AACM grew. And they had the additional objective of encouraging young people to learn music, and by doing so helping to upgrade the local community, and which still exists as the AACM School of Music. Thinking back now over these fifty years, the outcome of this small local initiative has been nothing short of amazing. Why would a white European boy like me – and many like me, around the world and of very diverse origin - be lifted up by this music, fascinated and mesmerized by these fantastic sounds that were created then, and that we still receive from AACM members today? 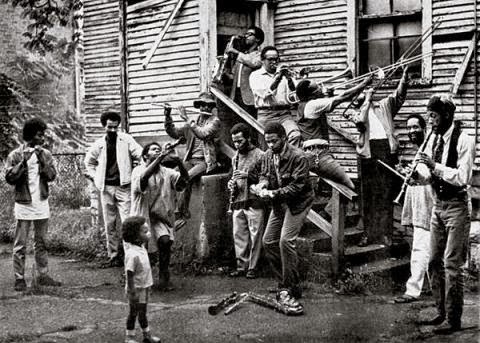 What is the magic of AACM? Second, and despite this label of “Great Black Music”, the approach was very inclusive, integrating the entire history of music from African ethnic elements, blues over gospel to Caribbean and traditional jazz, yet left space for other musicians like Roscoe Mitchell and Braxton to come up with more structural compositional ideas, influenced by modern classical composers. Even if the initial bands were almost entirely consisting of African Americans, gradually the bands and collaborations were more diverse. Third, their music has spiritual aspirations, breaking boundaries of music but thinking about the “brotherhood of man”, new ways of looking at society, with not only universal truths, as much as universal feelings, in the process opening up their activities to non-AACM members and to non-African American artists. This tradition combined with adventurous ideas, led to the slogan of “Ancient to the Future”, to describe the music’s scope. And fourth, and that is one of the oddity’s of history, that some of the musicians received more traction in Europe than in the US, with first the Art Ensemble of Chicago, then Braxton, Leroy Jenkins, Leo Smith and Steve McCall travelling to Paris where they had concerts and had their albums recorded, resulting in an immediate ‘commercial’ traction outside of the US, increasing the visibility and impact of the artists, who did not keep to themselves, but were invited to play in European bands and by doing so sharing their insights and influences to European artists. A further global cross-pollination of what was already cross-pollinating in Chicago. In sum, we, somewhere else in the world, appreciated the musical innovation, the combined strength of tradition and openness, of spirituality that unites us all, of forward thinking combined with rhythms and sounds that bring back the roots of all of us, deep in the African continent, and bring it back to life, while taking it to a fresh and creative new level, with concepts that nobody had ever heard before, and that now have become almost mainstream (well, maybe not). AACM not only created a local community initiative, it created a huge community of followers, adepts and fans across the globe. The AACM managed to get its voice, and how! One artist after the other became successful and became an influence for others, each doing their own thing, as was originally the idea, and the result today are hundreds of albums released by AACM members, on dozens of labels across the globe, influencing thousands of musicians across the globe, even today. Quite a feat! To honor all the work of AACM and its members, we decided to draft our own personal top-50 of albums by AACM artists, almost evenly spread over the decades. Have we covered all albums? Have we not forgotten some unknown gem? It might be, because even with six reviewers, we cannot have listened to all the albums that were released by AACM members, so there are definitely gaps in the list, but each of us, has to his best judgment, listed the albums that were most important for him as an individual listener, and without too much surprise, there was also no major disagreement among the Free Jazz Collective – although there was some discussion, as could be expected. Dear reader, if you want to list your favorite albums, feel free to react in the “Comment” section below. So in the coming week, we will review a significant part of those albums, so that interested readers have some reference to look back at the great musical output of the organization’s members and be encouraged to start looking for this wonderful music. The Free Jazz Collective wants to thank all AACM members for the great moments of musical joy we have experienced when listening to their music and wish the organization lots of success with its 50th anniversary. thank you so much for deciding to feature this anniversary. The musicians involved in AACM were and continue to be some of the most important in developing creative music. This blog has always been essential reading but this editorial choice to present a week long retrospective of an organisation so important to the music's history raises the bar of excellence we've come to expect from you. Thanks Mark - much appreciated! Hi, you can use photo of Gorge E. Lewis from the day before book came out. I have a rights to it. Thanks for the special feature. The music of the AACM has been with me for decades and I have been lucky to see and listen to the music for a long time. Here is my own 50 lp/cd list. It is very heavy on the pioneers of the AACM. Blue Winter, Birdhouse, The Milawaukee tapes, and From The River To The ocean.